Educational Qualification: The desirous and keen individuals must hold Graduation Degree (Commerce) / PG Diploma (Computer) & Tally from a recognized Board / University / Institute. Applicants belonging to SC / ST are required to paid Rs. 100/- as processing fee. The Maximum age limits of contestants should be below than 30 Years As on 01-02-2017. Salary And Payscale: After getting the selection for the vacant Posts, a pay band of Rs. 5400 - 20,200/- With 2800/- Grade Pay shall be offered to the candidates. 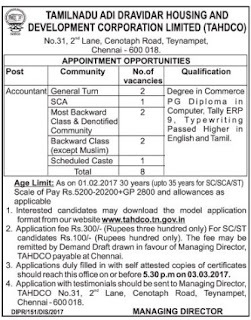 Contenders willing to apply for TAHDCO vacancy should download application form from official website that is http://www.tahdco.com. The Last date For Acceptance of Application Forms : 03-03-2017.